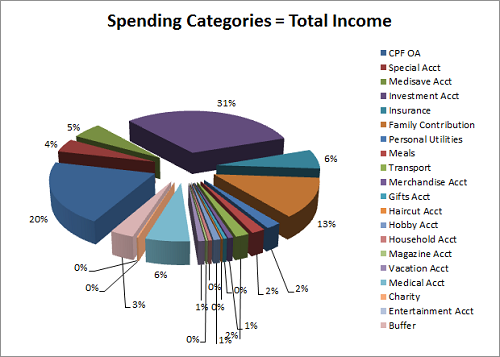 Many people have asked me what kind of budgeting method I find is the most effective in budget planning. I don’t think they deviate much but the one that I find the most effective is Envelope Budgeting. It is a systematic way to plan how much money you have to spend and how you go about to spend it in a control manner. Spend within the limits set! First step is to create categories of what you will spend on. Take note to include the most obscure spending, such as a one time child kindergarten fee, or a fee on an art course. 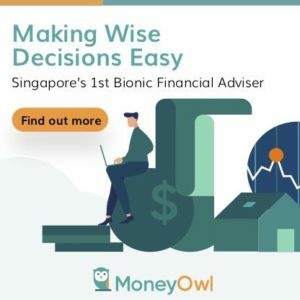 A lot of applications give you default categories and they are very useful because they are comprehensive, but it is much more worth it to do this as an exercise on your own because it enables you to come to grips with what you are always spending on. Gifts – includes red packets for weddings or chinese new year, white gold for funerals and birthday gifts. The trick here is that each category should be targeting some times. This means that I don’t really need a Medical category, but if my health is a on-going concern, I might want to separate it out for tracking. Second step is then to set an upper limit for each category you can spend. Note: if you total up all these 17 categories, they should equate to your disposable income. Once you have your categories, you translate them to envelopes on a monthly or an annual basis. Whenever, you received your paycheck, split your paycheck to the upper limit that you set in the previous step and then put into these envelopes. For those who think that envelopes are really old fashion solutions, there are other methods. I too think its not feasible to split into envelopes. Imagine what would happen if you lose those envelopes. 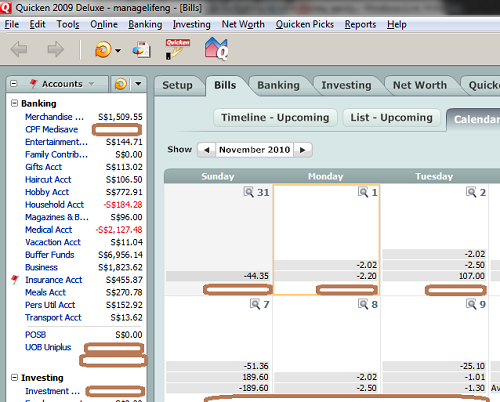 What I do is that I create virtual accounts in the budget planning software I use. This be it GNUCash, Quicken, Mint or iOS applications. In the above example I created the categories on the left panel into virtual accounts. 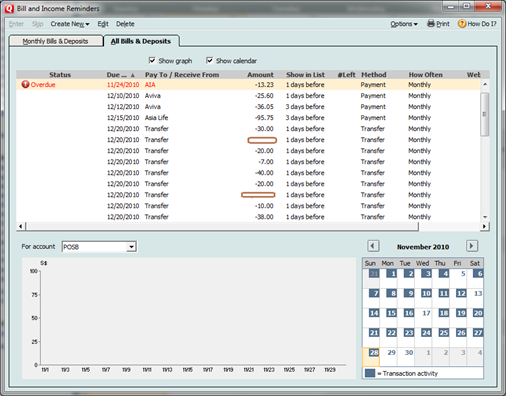 To automate the process if you are using applications like this, I normally setup before hand these monthly paychecks and transfers to these virtual accounts in Quicken so that come every x day of the month, these “envelope splitting” takes place automatically. What happens here is that although physically, your money is in one account but you have map out how much you can only use in each category. 3. Spend within the limits set! Once you did the hardwork for Step 1&2 all you need to focus on is not exceeding that spending. In my opinion, this method works because you create an upper limit to how much you can spend on each spending objective. It creates both a physical limit and sometimes a psychological limit. Monitor and review is an ongoing process that you do probably quarterly or half-yearly. When you key into your application daily or weekly, you would have observe the changes in your account. If you spend too much, the consistent red figure highlights to you that you are exceeding your limits and you have to drastically cut down on them. This might mean that you are not discipline in your spending or that you have allocated too little. If it’s the latter, you might want to change the limit. Do note to ensure they always total to your income. A great side effect to this is that you will also observe certain debt category being cleared. A –$2127 in medical account indicates that I have drastically overspend in this category. If I am able to bring it down to positive, then it means probably I am probably giving up on myself or getting better! You will also be able to monitor whether you saved up enough for that gadget you would always want to purchase or the vacation to the Maldives you have been dreaming of. Hi, regarding the setting up of virtual accounts as “envelopes”, then how do you set up actual accounts and monitor their balances? Does it mean I have to enter each transaction twice? Once for the actual account and another for the virtual account? Hi wilson, it is abit like accounting. Your paycheck or income from other sources normally goes into this real account. once it is in there, you transfer an x amount to your virtual account. when you expense from the virtual account, you just deduct from the virtual account not the real account, since when you transfer to the virtual amount that is the max amount set aside for that category. 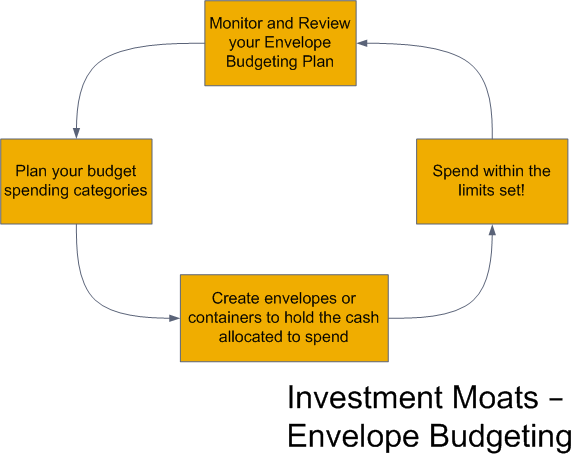 I have tried the budgeting software envelope system and I still had a hard time with not overspending as the money was readily available. However it did help me track money coming in and out with a pretty graph. I became a budge counselor with “Crown Ministry” and they utilize the “enevelope system” which I think is the best. It helps you see and know when you are out of money for that particular spending category. However, I agree, to use and walk around with envelopes is hard and with online bill payments is difficult to actually do. What you can do is remove any excess money from your account that will result in excessive spending…like keep clothing, misc, recreation, dining out, etc possibly in true envelopes. This way you have too track what you are spending both virtual and in the enevelopes. Now you ahve to think, calculate, and know just how much you are allowed to spend within that category becuase you have to take the physical cash out each time you want to spend (don’t recommend just carrying it around with you). thats an excellent suggestion. my take is take a step further place it in a hard to reach place. don’t make it easy for you to spend. 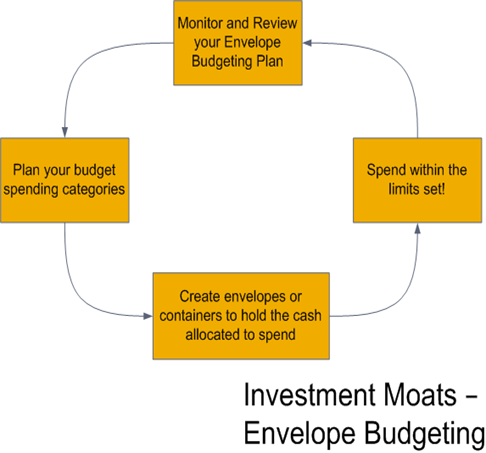 Have always read your blog and find it is interesting, especially on this post for envelope budgeting. I did that for my variable expenses and yes, sometimes I worry about monies lost! 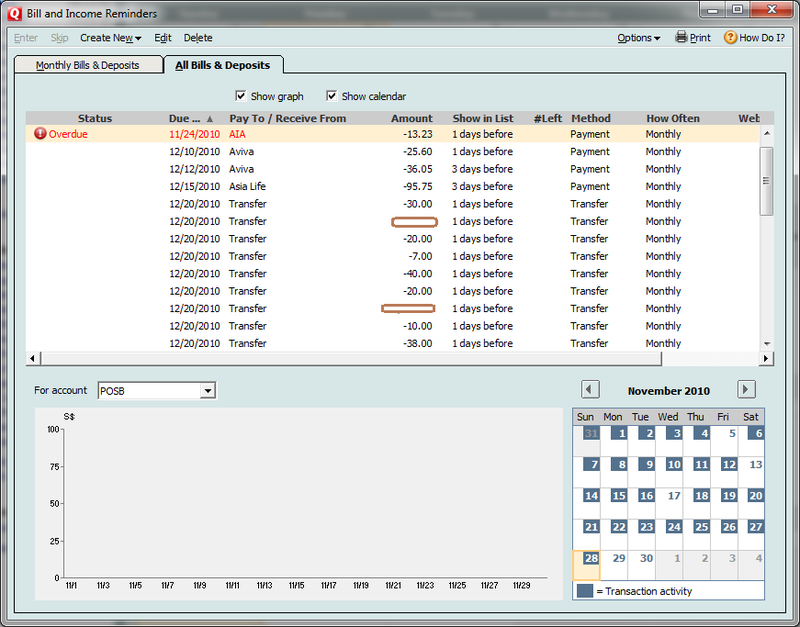 Not yet look into those financial software but it seems Quicken is not too bad? Will it be ok with you to do a blog link exchange? I wonder if your example is based on the realistic value or not. Your transport expense is about 2%. Assuming you take MRT 2x daily at 2 dollars each. I can reverse-calculate your income at least 6K a month. IF i earn 6k will investing 2k be too little? Hi! I don’t know if it’s because I’m seeing this too late, but how do you add Singaporean bank accounts to this app? I asked the mvelope help staff and they said they don’t sync with banks outside of the US.. Thanks for building such a wonderful and functional tool. Been using it for a year now. I’m wondering whether you have issues with Yahoo price update? It is suddenly not working for me this week. When i look at the shared google spreadsheet, the yahoo price is also not updated.